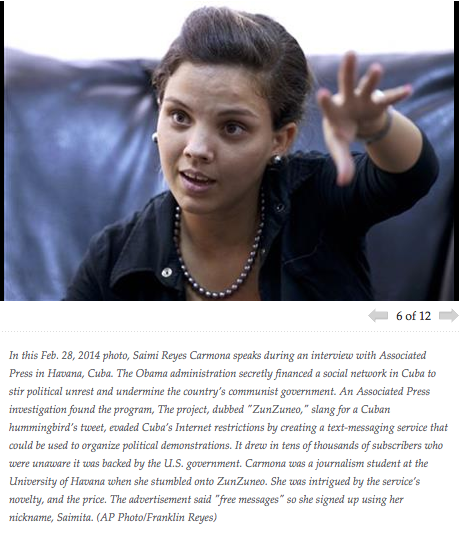 The Associated Press report that “US Secretly Created ‘Cuban Twitter’ To Stir Unrest (see: http://bigstory.ap.org/article/us-secretly-created-cuban-twitter-stir-unrest which is also the photo source.) The mission of USAID is: “Our Mission: We partner to end extreme poverty and to promote resilient, democratic societies while advancing our security and prosperity.” (Source: http://www.usaid.gov/who-we-are/mission-vision-values). The article describes a two year program purportedly set up to undermine the Cuban government by providing a communication media outside the Cuban government’s control. The article indicated that the program lasted about two years and vanished as suddenly as it appeared. Some big questions pop-up here. First of all, assuming this is all true – does this mean that the Department of State (DoS) has expanded its influence role beyond public diplomacy? Where would USAID get the capabilities and resources both technologically and content-wise to set-up and run such an operation? Another obvious one for the MISO Community (perhaps not answerable in this venue) is what sort of involvement, if any did the DoD have? Rather than tread where I shouldn’t let me turn the conversation in a different direction. Now that the Army Cyber Command is entrenched at Fort Gordon – should the military version of this sort of operation be part of Cyber Command or part of MISO? One could argue that the technology is pure cyber or one could argue that the technology is so mainstream that no special technical depth is required. A strong argument could be made for the fact that technical folks are not content savvy and that content needs to be developed by those with MISO skills. It’s also possible that the force of the future (and not too distant future) will have cyber skills just as they have rifle and pistol skills today. We have seen that cyber skills are necessary with conventional forces as shown in the Ukraine and our experience in other conflicts shows the need for cyber in conventional and asymmetric settings. I recognize that my readers are not totally neutral on the subject, and look forward to comments from the field.